On April 29, both the Thoroughbred and sport horse industries came together to celebrate the opening of Phase One of New Vocations at Mereworth Farm. Over 600 guests toured the new facility, enjoyed a southern-style BBQ dinner and fantastic music from local band Frontier. Guests toasted the new Whirlwind Poppy barn donated by Elise Durbin and the John Hettinger arena, donated by Fasig-Tipton. Beverages were generously provided by Country Boy Brewing, Buffalo Trace distillery and Jackson Family Wines. 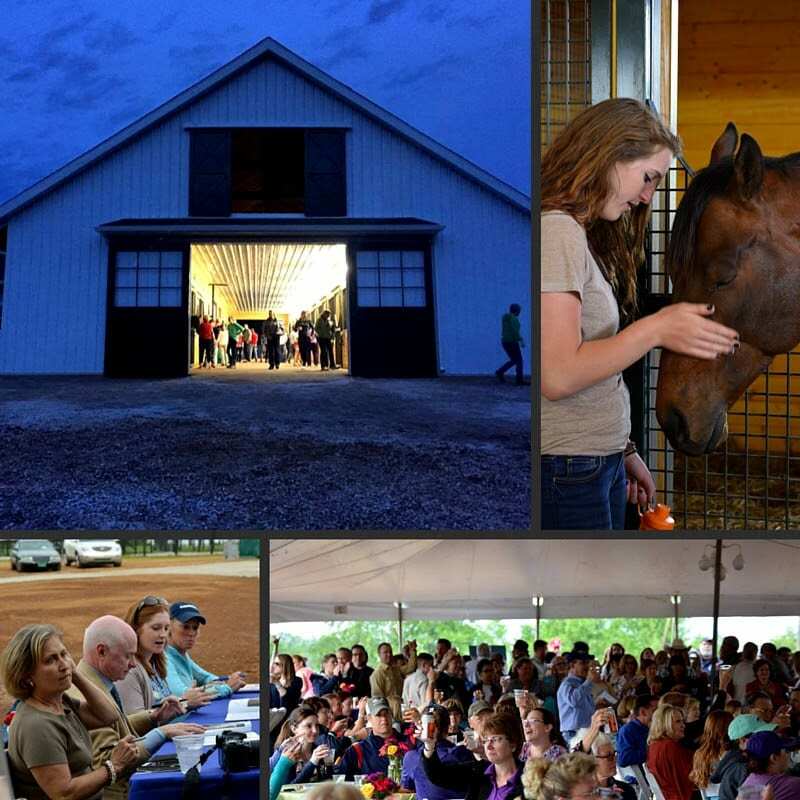 With the unveiling of the John Hettinger Arena and the Whirlwind Poppy Barn, New Vocations is officially operating out of their new Lexington home on Mereworth Farm. When finished, their new location will allow them to double the amount of retired racehorses they care for in Kentucky. Acclaimed jockeys Chris McCarron, Jean Cruguet, Rosie Napravnik, Sophie Doyle, Robby Albarado, Mickey Solomone, Jacinto Vasquez, Suzie Oldham and Kaoru Chatfield-Tsuchiya were on hand to celebrate the new facility and to sign autographs. Four-star eventing competitor Colleen Rutledge, Director of Marketing for Fasig-Tipton Terence Collier and Hall of Fame jockey Chris McCarron spoke briefly on the importance of Thoroughbred aftercare and their excitement about how the new facility will positively impact hundreds of retiring racehorses. The entire facility will encompass two 15-stall barns, indoor and outdoor arenas, an office and multiple pastures and paddocks. An additional 20 stall barn designated for horses in need of rehabilitation is also graciously provided by Mereworth Farm. This effort would not be possible without the generous support from members of the Capital Campaign and the Susan S. Donaldson Foundation, which has been integral to an expansion of this kind. Upon completion, New Vocations at Mereworth Farm will be the nation's largest rehabilitation, retraining and rehoming facility for retired racehorses. This entry was posted in Horse Care and tagged chris mccarron, colleen rutledge, fasig-tipton, Horse Racing, jacinto vasquez, Jean Cruguet, Kaoru Chatfield-Tsuchiya, Mereworth Farm, Mickey Solomone, New Vocations, Off Track Thoroughbreds, OTTBs, Robby Albarado, rosie napravnik, sophie doyle, Suzie Oldham, thoroughbred, Thoroughbred aftercare, Thoroughbred breeding by Press Release. Bookmark the permalink.